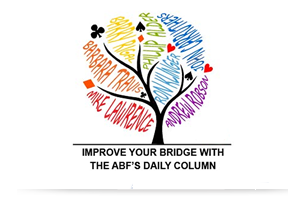 The ABF has implemented an Accreditation Scheme to help club teachers demonstrate they have a solid foundation in bridge education. To attain accreditation a teacher must accrue 65 points. Participants must first complete the Teacher Training Program. This guarantees a teacher 15 points towards accreditation. Subsequent to completing the TTP a teacher has 24 months to accrue the remaining 50 points required for accreditation. Free seminars, sponsored by the ABF with assistance from the State bodies, are offered in various locations throughout the year. The Teacher Training Program covers how to teach bridge, while Continuing Professional Development Days focus on what to teach students. The Teacher Training Program should be completed before attending a CPD Day, however teachers who cannot attend a Teacher Training Program Day can watch a video and complete an exam online. Find out more about the ABF’s accredited teachers. Useful tips and resources for teaching bridge. Subscribe to the Teachers Update to receive the updates of upcoming workshops, teacher news, tips and resources. Or join the Conversation on Facebook.